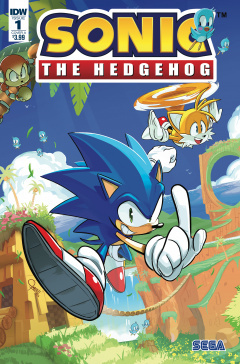 Sonic the Hedgehog #1 is the first issue in the Sonic the Hedgehog comic series published by IDW Publishing. This issue also features a preview for a then-upcoming Skylanders comic from IDW. The comic begins with an introduction to the series: for years, Sonic the Hedgehog has battled the forces of Dr. Eggman, showing up to thwart the mad doctor's schemes and then relaxing until Eggman makes his next move. After their last battle, Dr. Eggman had vanished, but his robot army has not. In the present, Sonic comes across a town that is under attack by Badniks whom the locals are trying to fight off and proceeds to help the locals, starting with taking out Egg Pawns and helping a resident armed with a Cube Wispon, to the resident's amazement from meeting Sonic in person. Sonic then takes off in a hurry to rescue the rest of the town, telling the town's militia that Badniks are coming from the north and to go help the resident he just helped. A bunch of Moto Bugs try to go after a pair of townspeople, but are fortunately stopped by Sonic. Sonic then comes across some Super Badniks: the Egg Hammers, only to be surrounded by a group of them. As they try to whack him, he escapes into the town's underground system to avoid being hit, then, as they try to attack him again, Tails shows up and saves Sonic, and the two decide to handle this like the professionals they are and take out one of the Egg Hammers with the Rolling Combo, then take on two more Egg Hammers. Exhausted, Tails thinks this would be easier if Knuckles was with them, but Sonic assures him that they are doing fine. Tails immediately notices the remaining Badniks are trying to flee, and closes the town's gate on them, causing them to crash into it while Sonic deals with the remaining Egg Hammer. Though Sonic sees the Badniks as troublesome pests, Tails feels the attack was much more coordinated than anything else they have seen lately, despite the fact that they broke the Eggman Empire's control over the world after they beat Eggman and his forces. This meant that while the Badnik army remained, they were now directionless and no longer a united threat, and any attack from them seemed more accidental than aggression-based. Today, however, the Badniks acted more like an organized army, which makes Tails deduce that something is making Eggman's army more cohesive. Getting the point, Sonic wonders if it means Eggman is back, but Tails does not think that is the case: after his last defeat, Eggman would undoubtedly make sure Sonic and co. knew he was back, as he always does that. Whatever the case might be, Sonic decides to keep going around and smashing any Badnik he sees whether they are organized or not, even if someone could be controlling them. Seeing that Sonic is not going to change his mind, Tails tells him to be careful while expressing his anxiety over the thought of losing Sonic if he gets caught off-guard again. The hedgehog offers him to come along if he is so worried, but seeing the town in ruins and the people in despair, he decides to help the locals rebuild their town, to which Sonic comments on the decision by calling Tails a class act and hopes to bash robots together again some time.